Gone are the days when choosing vanity lighting involved choosing a style, finish and number of bulbs for your vanity light bar. 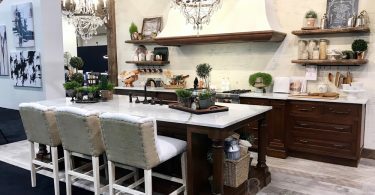 Today, homeowners and designers are mixing things up with scones, pendants and more! Here are a few ideas from some of our designers. WHAT MAKES IT STAND OUT: Instead of putting the light on the mirror, Negar aimed for a more modern application and used two small pendants on each side of the double sinks. The finishes of this master bathroom is rather traditional with marble basket-weave flooring and oak cabinetry but the modern light fixture and its application pushes the design toward transitional. Hanging pendants definitely give the bathroom a unique, unexpected look and it also offers up a wide variety of design possibilities. This is also a great solution if you want to maximize mirror space but can not mount lighting right onto the mirror. LIVING LIGHTING TIP: Fixtures in the bathroom are subject to frequent steam and moisture exposure. Choose a pendant made of an easy to clean material like metal and crystal and avoid materials like linen shades that may become damaged and are harder to ripe clean. 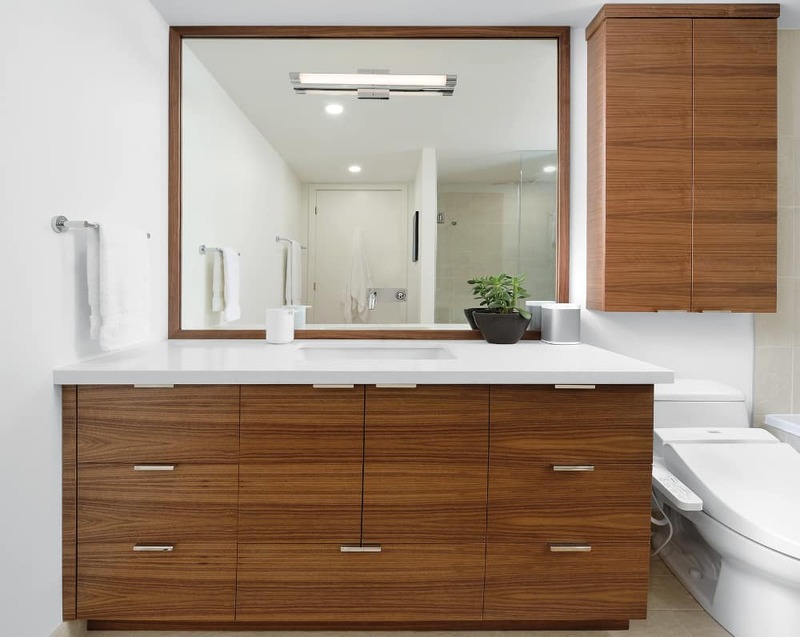 WHAT MAKES IT STAND OUT: In this bathroom, Designer Jamie Banfield choose to use two scones mounted on either side of the mirror rather then a vanity bar above the mirror. There are a number of reasons why you might want to consider using sconces instead of a vanity bar. Side-mounted sconces offer a more even light with less shadows, an important consideration if this is also where you’ll be doing things like applying makeup regularly. In a small bathroom, using sconces creates a more horizontal sight line, elongating the space and making it feel larger. On the other hand, you can break up the large expanse of a double vanity by using two separate mirrors and three scones for a more intimate feel. LIVING LIGHTING TIP: For best results, mount fixtures at least 28″ apart and 60″ off the floor. 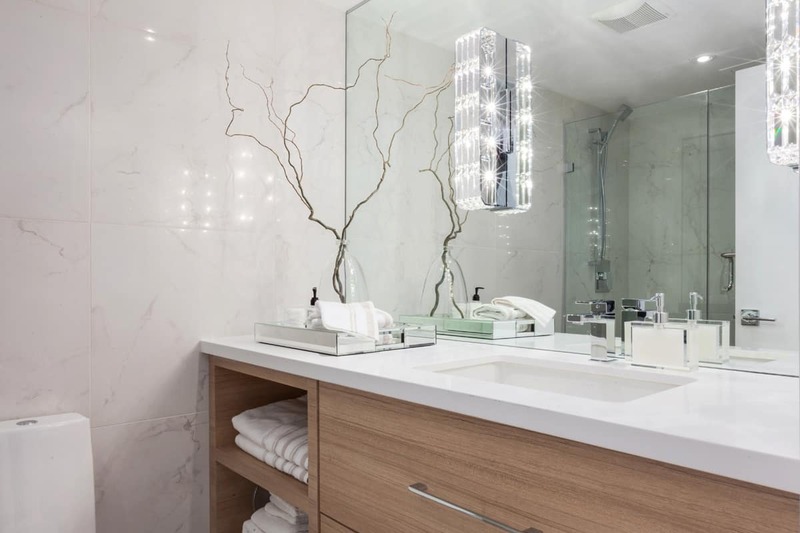 WHAT MAKES IT STAND OUT: Sconces are mounted directly onto the mirror! 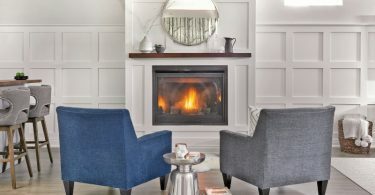 If you love the look for a side-mounted sconce but don’t want to sacrifice mirror space, this is a great solution. You can still choose a wall to wall mirror for maximum impact and then have the fixtures installed over the mirror. This is especially useful in small bathrooms as the mirror reflects the light back from the scones, making the room feel bigger and brighter. 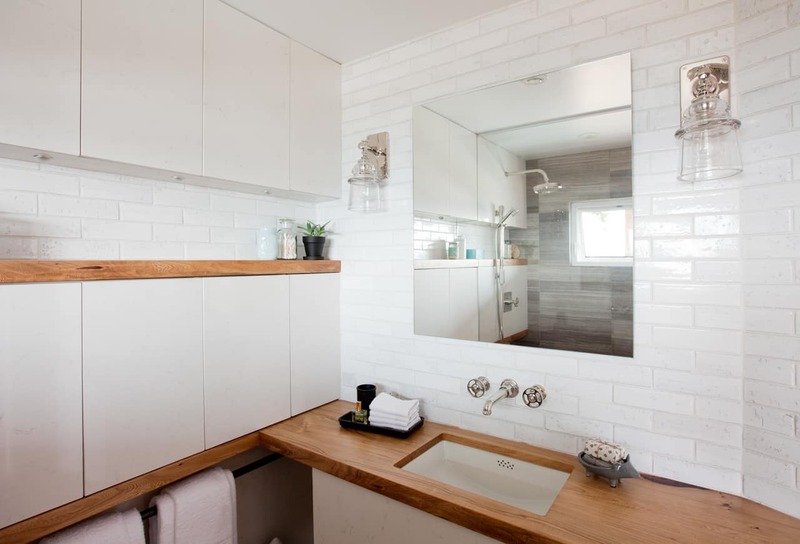 WHAT MAKES IT STAND OUT: While David still went with a vanity bar, he choose a more modern version and mounted it on the mirror rather then above. If you still prefer the look of overhead lighting but want to give it a more modern feel, this is a great choice. Mounting the vanity bar onto the mirror gives you many of the same benefits you get from mounting a sconce over the mirror; a larger available space for the mirror and more light reflected back into the room. In the bathroom above, the light fixture mimics the linear shape of the vanity and cabinet pulls which helps to pull all the pieces together. LIVING LIGHTING TIP: Mount the strip 78″ off the floor. If you’d like to maximize visible mirror, choose a fixture with a smaller center plate rather than a full length mounting plate. WHAT MAKES IT STAND OUT: Under cabinet lighting brightens up a storage shelf. In this bathroom, two rows of cabinets run along the wall and continue through the shower to conceal plumbing. The space between the cabinets creates a useful shelf space for displaying often-used items. To keep this shelf space from becoming a dark spot int he bathroom, under cabinet lighting was installed through out. Not only does this brighten up the space, but it also makes an interesting decorative feature as well! When planning the lighting for your bathroom, think beyond the decorative and consider using pot lights, under cabinet lighting and other accent lights to brighten up darker spaces. LIVING LIGHTING TIP: Under cabinet lighting can make middle-of-the-night trips to the bathroom safer and easier. Install a low-voltage linear lighting or LED system in the toe spaces beneath the vanities and cabinets. Consider installing an occupancy sensor wall switch so the lights come on when you need them and switch off when not in use to save energy. WHAT MAKES IT STAND OUT: A fun, modern chandelier hung above the freestanding tub becomes a decorative focal point. Using a freestanding tub as a decorative focal point of the bathroom is a very popular trend right now and we love this look. 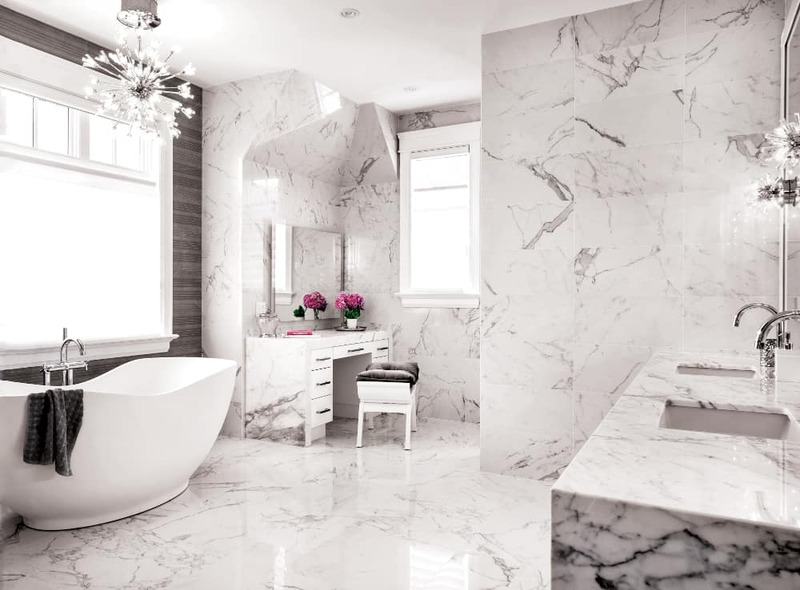 It gives the bathroom a luxurious, spa-like feel that welcomes you to come in, relax and let go of the stress of the day. This also offers the opportunity play with creative lighting, adding stylish luxury to the space with a pretty chandelier above the tub. 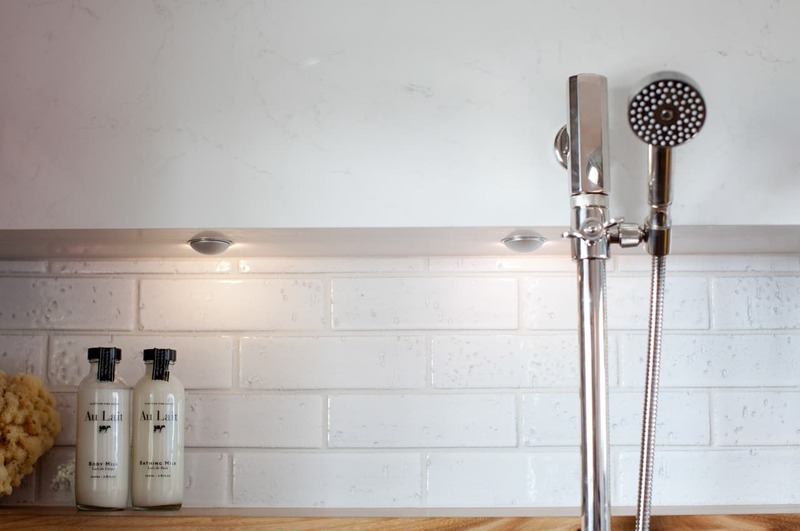 LIVING LIGHTING TIP: Make sure to put bathroom lights on a dimmer! While you may want a bright, airy space for many daily tasks, a dimmer will allow you to create a calm, relaxing feeling on those days where you just want to sit back and soak for a bit. Thank you so much for your post. It is really a great help.